The floor in this section was laid with Indian sandstone paving in a stretcher pattern. Acrylic planters containing architectural copper grasses line the left boundary. A Yellow Balau hardwood decking path cuts through the paving and leads to the second section of the garden. 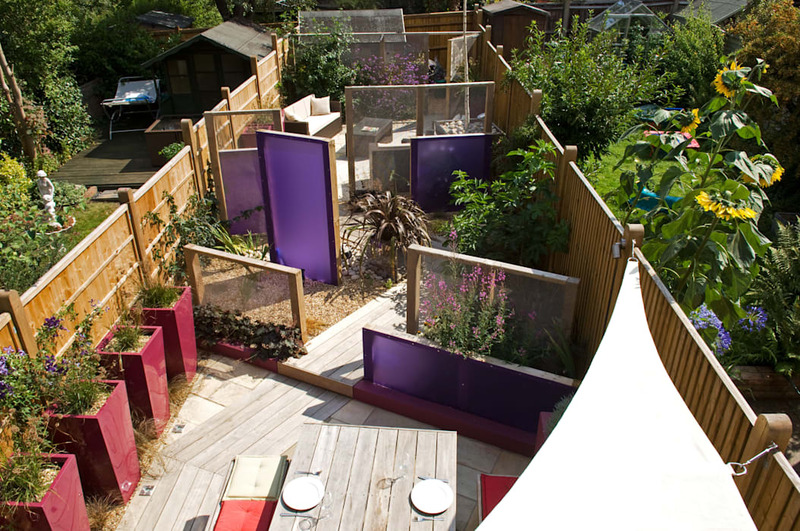 The second section consists of two large planting beds bisected by the decking paths. The beds were planted prairie-style, interspersed with a selection of Perspex and stainless steel mesh screens of varying heights and sizes to create drama and structure to this area. The central triangle of the space is framed with two stainless steel cubes 50cm square. Each bed was edged to create definition and retain a pea shingle mulch. The central segment of area was mulched with Scottish cobbles. The final section of the garden was designed for comfort and relaxation. It features a large outdoor rattan suite, a giant stainless steel planter containing a tall silver birch tree and two series of 3 colourful acrylic planters, all set against a backdrop of a stainless steel mesh screen straddling the width of the garden. This screen, interwoven with fragrant climbing jasmine, masks the shed and utility area at the bottom of the garden.